Ashford Borough Council advises dog owners that, provided that dog waste is wrapped and tied securely, they may dispose of their dog waste bags in either the ordinary black litter bins, or the red 'dog waste only' bins. Either way Ashford Borough Council will collect the dog waste bags regularly and incinerate them along with the rest of the unrecycled waste. To report a full dog waste or litter bin please email the street cleansing service. 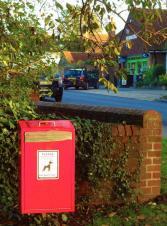 The Parish Council provides eleven red dog waste bins beside the main footpaths leading out of the village, and around the recreation ground. However, Ashford Borough Council is the waste authority, and therefore ABC has a legal responsibility for emptying the bins, imposing fines, and dealing with stray dogs. clearing up, etc. The Dog Warden will collect stray dogs between 8.30am and 5pm, Monday to Friday and take them to the council's nominated kennel. To report a lost or found dog, or dog fouling please contact the Dog Warden, who also provides enforcement and education services in respect of dog fouling issues. In all instances where evidence is obtained formal action will result, including the issue of on the spot fines (Fixed Penalty Notices). In September 2015 the Borough Council announced that it would longer provide free dog waste bags to dog owners. In response, and in the public interest, the Parish Council took over this service from ABC and provides dog waste bags in Wye News - but for dog owners resident in Wye only. Supplies are limited and subject to fair use. In case of an emergency involving a pet, please contact Wye Veterinary Surgery (01233 813 003) Full emergency service out of hours for pets, 24 hours a day, 365 days of the year provided by Cinque Port Vets.